Berms provide a raised planting area in an otherwise flat location. Their original function was to allow excavators to leave excess soil on site and avoid the expense of removal. Most garden berms create a unique flavor to a yard by providing natural raised flowerbeds. Berms also provide a border around a yard perimeter for privacy. Planting berms requires an evaluation of the soil quality, available sunlight and overall landscape design to help these irregular features blend in and become a natural addition to your landscape. Most homeowners purchase a house with existing berms and do not realize what they can do with these interesting landscape features. Grass covered berms look like bumps on the lawn and in some cases like an eyesore when not landscaped properly. 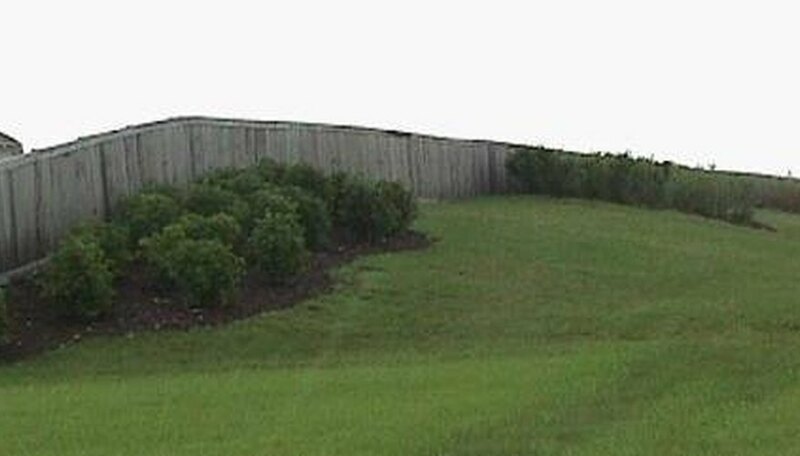 Many homebuilders create berms around the property line to encourage homeowners to plant privacy hedges or shrubs. The best berms incorporate a natural curve. These berms tend to be irregular shaped, raised above the surface level in the center of the "bump." For example, a flat garden rising gradually to a center flows better with a landscape plan that doesn't leave a plain, rounded bump. Berms can be quite functional and beautiful when planted properly. Your major decision lies in deciding if you'd like a berm garden or privacy feature. Homeowners and builders create berms from loose, extra soil around the home site. Some dump excess paving bricks or rocks to form the raised area. This leads to a berm that isn't optimal for planting. To ensure a soil that will support plants and shrubs, regardless of the berm's composition, work compost and peat moss into the top two feet of soil. By preparing a good soil, you can plant anything from a pine tree to a flowering annual in your berm garden. Many homeowners plant traditional berms with sturdy pine trees that grow slowly but steadily over the years to create a beautiful green fence. The biggest drawback to filling berms with pine trees is the absence of any variety along the berms. As pines grow, they block sunlight from reaching smaller plants. However, pine trees are an excellent choice for privacy and provide a handsome, low maintenance planting for any berm. Berms allow the gardener to choose plants and shrubs of varying heights to blend with the contours of the garden. More than any other garden, berms beg to be transformed into graceful rock gardens. Consider randomly spacing a few larger rocks throughout the garden. Evaluate how your plants can best accent the garden and your rocks. Tuck plants next to the rocks so the foliage can drape over the rock. Plant taller ornamental grasses on the highest point as a dramatic centerpiece. Intersperse tall plants and ground covers to create asymmetrical balance within the berm garden. Balancing one side with another only makes the garden look too organized. Evaluate the available sunlight in the garden before purchasing plants. Also make sure your garden hose can easily reach the plot for maintenance watering. If water availability presents a problem, consider xeriscaping the berm. This type of planting includes extremely low maintenance plants with a high heat tolerance. Your local grower can help you make the best choices for xeriscape plants. Berms create another challenge for the gardener when applying and retaining mulch. A sharp slope will always result in a pile of mulch at the lowest point. If possible, keep the slope of the berm to less than 45 degrees to prevent excessive runoff. Observing the garden during heavy rain will help you locate the problem spot in the berm for removal. Since berm gardens traditionally don't have an edged border, consider edging around the base using a flat-bladed shovel. Digging this trench creates definition to the berm garden, enhances your plants and provides a natural basin to catch runoff.